Fuel ethanol remains a significant market for the growing corn supply, and KyCorn works to ensure this market remains strong for our growers. Even among the production challenges of weather and pests, corn farmers continue to produce enough corn for livestock feed, food, and clean-burning, American Ethanol. Kentucky Corn Promotion Council places an incredible amount of energy and checkoff investment towards market development of ethanol. The charts and graphs on this page explain why in a very clear manner. We are living in the same profitability environment as the rest of Kentucky’s corn farming community. As leaders of the organization and stewards of farmer investments, we know the importance of 30 percent of the corn utilization – more importantly, we know what our world would look like without the 30 percent of corn demand. Our investments range from technical and financial assistance for retail fuel stations to ethanol trade promotion to education and image relations for ethanol toward specialty engine owners. And more. It takes a village, and we go to bat with friends like Renewable Fuels Association, Growth Energy, American Coalition for Ethanol, the Kentucky Community and Technical College System, U.S. Grains Council and many, many other partners to ensure that ethanol gets its fair chance into the market. We want Kentucky checkoff contributors to see and understand the value of their investments for their bottom lines, and to aspire as we do for expanding corn demand from ethanol so that the next generation of farmers have opportunity. Just like you, I have sons wanting to come back to the farm, and a thriving agriculture economy built on a diverse demand-base will help make that happen. As KyCPC chairman, I want to personally thank you for your investment, and I want you to see first-hand the difference it makes to farm profitability. As with any emerging industry, policy plays an undeniable role in an ability to establish a meaningful commercialized presence. Ethanol is no different. We are nearing the third trimester of the Renewable Fuels Standard. It is unquestionably the reason we have a foothold in the fuel market—prior to the RFS, the oil industry has used its monopoly to prevent ethanol from advancing into the market. History proved multiple times that ethanol couldn’t establish itself without a requirement, so in 2005 and 2007, Congress and a President from Texas decided to create a policy that would allow the industry a chance to establish demand. The RFS is the reason my grain enterprise has expanded over the past decade – corn farmers across the nation are united in that realization. I’m proud of the job that Kentucky farmers have done in protecting that policy. But the RFS has only given us a foothold, growth from here has other aspects. The future of our industry is not solely about the RFS. For corn farmers to grow our industry as fuel providers, key regulations have to be modernized. Ethanol is the industry leader in octane, but we need updated regulatory guidelines to ensure its legality. Our lower cost, higher performing fuel product, E15, is an obvious win for consumers, but we need a few minor regulatory fixes to allow full access to all American consumers all the time. There are many more policy priorities that clear the path or more consumer fuel choice. In large part, due to checkoff investment, we have established the data to prove that science and safety are on our side. Now that data is in our hands the tall task of updating the rulebook is before us. That’s going to be the job of farmer members of Kentucky Corn Growers Association and similar organizations. Stay tuned, and stay involved. It’s an honor to serve as your president. Commonwealth Agri Energy, LLC (CAE) began production in March 2004 as a partnership of Hopkinsville Elevator Company and the KY Corn Promotion Council, with help from the KY Ag Development Board. KY Corn Promotion Council assisted in the beginning stages by helping extend capital to the project. CAE is a true success story of initiative and business innovation that benefits farms, consumers, and communities throughout the region. Direct benefit to 3,453 patron stockholders in 65 Kentucky counties. Supplies fuel ethanol to the Nashville market, which includes most of central and western Kentucky as E10, E15, and Flex Fuel! Uses 12 million+ bushels of corn, annually, to produce over 35 million gallons of ethanol. Provides 107,000 tons of DDG animal feed, mostly sold to poultry in surrounding counties, Distillers Corn Oil for livestock feed and biodiesel, and CO2 gas supplied to Airgas to make food grade liquid CO2 and Dry Ice. Expansion underway to increase capacity this year to 45 million gallons. The development of international markets for ethanol is of great interest to farmers because advancing ethanol use is an efficient means to increased corn utilization. However, developing global ethanol markets is very challenging work. KyCorn is at the table in these discussions through our participation with the U.S. Grains Council working to make the most competent technical experts in the world on ethanol topics available to our prospects and consumers abroad. Kristy Moore, who writes below, is one of these experts; Angela Tin, also featured, is another. We leverage your checkoff resources carefully to bring experience and education to the decision making processes of foreign ethanol buyers. Global fuel markets are learning the value that embracing ethanol brings to their fuel supply. The largest fuel markets on earth are moving toward ethanol blending because they are seeing the success in the USA. China has mandated 10 percent ethanol blends. Canada and Mexico are introducing 10 percent ethanol blends. We are targeting India and Japan with constant messaging and facts on ethanol. The chart on page 5 marks our progress. That’s good news for farmers who have a knack for creating big piles of corn. showing ethanol’s value as a source of octane. Today less than two percent of the world’s energy markets contain a biofuel. This percentage, while extremely low, shows massive potential to introduce ethanol to improve air quality, extend fuel supplies, fulfill the octane shortage in gasoline markets and address climate initiatives. Inserting American ethanol into these markets is an obvious win-win for these countries and U.S. agriculture, but there are challenges and apprehension with any change – adopting ethanol as a liquid fuel is no different. These governments want the benefits that American ethanol can provide, but their regulatory agencies are unfamiliar, and in some cases uncomfortable, with the details of transitioning from a fully petroleum-based fuel to ethanol blends. It is our responsibility to prepare them for challenges relating to chemistry, materials compatibility and other essential factors that come with decisions to embrace ethanol. We already know these hurdles are surmountable; in the US we have transitioned from 100 percent petroleum to various levels of ethanol blends over the past couple of decades. Even as we overcome technical hurdles, doing business globally is not always easy. There are language barriers in discussing complex topics, units of measure differences, currency valuation issues, and different product quality expectations. I’m proud to work on your behalf in these arenas. My role is to be a trusted technical expert in many aspects of the adoption process to convince and prepare buyers, and ensure our customers experience as much of a problem-free transition as possible. Adding to the technical issues, the same market share issue that we deal with domestically exists in many of these destinations. Big oil doesn’t only exist in the USA. We will succeed because the facts are on our side. These efforts are paying off. In 2016/2017, a record 1.37 billion gallons of U.S. ethanol – 488 million bushels in corn equivalent – were exported to 76 countries. A reality of developing any market is that policy plays a major role in a new industry’s success and survival. For ethanol, the Renewable Fuels Standard provides consistency to give the industry an opportunity to grow demand, innovate technology, and modernize regulations. The charts below provide clear evidence that a society is better with ethanol and fuel choice. KyCorn seeks to empower its farmer members to leverage grassroots engagement for legislative and regulatory actions that can bring the pieces of ethanol’s complex puzzle together. Through significant investment, American grain farmers have ramped up production technology and infrastructure that has dramatically increased their capacity to create corn supply to fulfill ethanol demand. Corn’s trend line yield increases correspond almost perfectly with ethanol production increases. We know that if politicians renege on the energy policy that they set into motion, they destroy demand almost instantaneously. Farmers are left holding the bag in that scenario, which warrants your attention as a grassroots advocate. With more than 5 billion bushels of corn used in ethanol and DDGs production, stable policy that provides opportunity for growth is essential for corn farmers. In recent months, we’ve experienced a great deal of ethanol policy uncertainty, largely around the Renewable Fuels Standard and regulatory actions to benefit refiners at the expense of farmers. Kentucky farmers stepped in to advocate for the RFS, using agriculture’s voice to hold EPA accountable. While we continue to protect the market access that comes from the RFS, corn farmers are also looking for opportunities for growth. Consumers can help us advocate for more choice at the pump that saves them money, especially choices such as E15 and higher blends. We’re re-engaging the environmental community to show them the improved sustainability and productivity of corn. With the strong foundation of the RFS, corn farmers are positioned to build lasting support for ethanol. Over the past 10 years, since the RFS2 passed in 2007, the United States has seen a significant increase in ethanol production. The increased demand for corn that comes with advancements in the ethanol industry have revitalized rural economies, incentivized the building of both on-farm and regional agricultural infrastructure, benefitted consumers’ pocketbooks and decreased harmful transportation emissions. Despite these advancements, there are still naysayers; these charts contain the facts of some of the more predominant arguments about ethanol’s impact on land-use, the environment, the economy and consumers. This information was generated by federal government sources: USDA, EPA, U.S. Energy Information Administration and US Bureau of Labor Statistics – not some hired-gun think tank. The science of ethanol is simply amazing and brings unlimited possibilities; its capabilities and the benefits it brings to society are staggering. This technology helps us make the world a better place. So I’m frustrated that some ethanol opponents try to establish a quandary that we must choose: “food or fuel.” Corn-starch ethanol production is an awesome “food and fuel” story. One-third of every bushel of grain that enters the ethanol process is enhanced and returned to the feed market, most often in the form of distillers grains. As a poultry grower in Kentucky, I benefit from the distillers grains and other feed value co-products from ethanol production. Last year, the U.S. ethanol industry generated a record 41.4 MMT of distillers grains, gluten feed and gluten meal. Kentucky, because of our large poultry industry, is a particularly large beneficiary of ethanol co-products. All of the CAE distillers from Hopkinsville stays right here in the chicken feed market. Nationally, most of those valuable feed products go the cattle industry. The American corn farmer stands ready to meet the challenges of consumer demands for both food and fuel. Learn more about ALA's Clean Air Choice Initiative. As an advocate for human health, I can’t say that I ever envisioned have such a close working relationship with farmers, but the longer I spend at ALA the more I realize our common goals. Based on our endorsement of renewable fuels such as ethanol, you can be pretty sure that improved air quality is part of the equation. Toxic emissions and particulate matter from vehicle exhaust are a huge threat to human health—and because of its clean-burning properties, ethanol has a significant positive effect on air quality. Greenhouse gas emissions (GHG) associated with corn-based ethanol are about 43% lower than gasoline, according to a 2017 USDA report – that’s big to an organization focused on curbing asthma, lung cancer and other respiratory diseases. Carbon monoxide, which can cause harmful health effects by reducing oxygen delivery to the body’s organs. Exhaust hydrocarbons, which contribute to ozone, irritate the eyes, damage the lungs, and aggravate respiratory problems. Air toxics like benzene, which can cause cancer and adverse reproductive effects or birth defects. Fine particulate matter, which can pass through the throat and nose and enter the lungs, causing serious health effects. I value our partnership for other reasons, including the fact that farmers are good public citizens who want the very best for the communities that they live and farm in. If farmers are to continue to depend on the ethanol industry as a market for corn, consumer adoption for ethanol blends must continue to improve. Ethanol in fuel is a relatively new concept in mainstream America, and there are plenty of opponents who seek to drive consumers away from an ethanol choice because it threatens ‘their’ market share. Their tactics are confusion, fear and misinformation. Corn designs and executes a variety of programs towards all groups of the fuel users. Whether the fuel is purchased for use in automobiles or boats or seasonal-use engines, we have to be sure customers understand their options. As America breaks its reliance on liquid fuel that is derived from petroleum, consumers have to be more aware of what fuels can be used in which engines. It’s a necessary growing pain, but we make progress every day. For us, it’s easy to understand the concept of “Performance, Price and Piece of Mind”, the challenge is instilling the same understanding in all fuel users. KyCorn investments into a partnership with Renewable Fuels Association (RFA) helped bring Paul Jr. Designs and AMERICAN CHOPPER back on the air after a six-year hiatus from reality TV. The legendary motorcycle craftsmen returned to Discovery Channel with the premiere of AMERICAN CHOPPER on May 27. 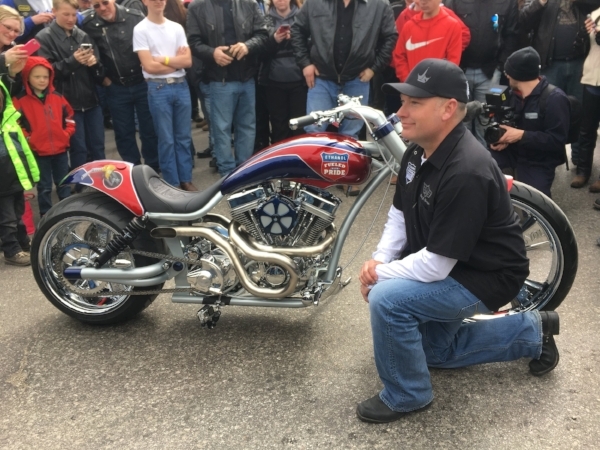 A few episodes later, RFA’s custom built E85 bike was featured in the new series along with some straight talk by Paul Teutul, Jr. and others about how ethanol adds benefit to the American economy and E10 fuel is safe for motorcycles. American Ethanol is the title sponsor of the Crappie Masters Tournament Trail, as well as a sponsor of 2 angler teams. KyCorn and TnCorn team up through the KY/TN championship to work with local media and leaders to explain how E10 is not only safe in marine engines, but share the many other benefits of the ethanol fuel. The Preparing Vehicle Technicians for Advanced Transportation Fuels Project is an initiative designed to develop an advanced transportation technology training program at Owensboro Community and Technical College. The program is the first college program in the state and the nation to offer technician training in all of the advanced transportation-alternative fuel vehicle technologies. On March 12, the U.S. Environmental Protection Agency (EPA) proposed regulatory changes to allow gasoline blended with up to 15 percent ethanol (E15) to take advantage of the 1-psi Reid Vapor Pressure (RVP) waiver for the summer months that has historically been applied only to E10. This week, farmers and members of the renewable fuels industry came together at the Farm Progress Show in Boone, Iowa to welcome and thank Ag Secretary Sonny Perdue for his support of America’s farmers. KyCorn's investment into a partnership with Renewable Fuels Association (RFA) helped bring Paul Jr. Designs and AMERICAN CHOPPER back on the air after a six-year hiatus from reality TV. Kansas corn and ethanol leaders told Administrator Scott Pruitt that his efforts to undermine the Renewable Fuel Standard (RFS) are helping Big Oil while hurting rural America. Administrator Pruitt toured the East Kansas Agri Energy LLC ethanol plant in Garnett, KS and sat down with a roomful of farmers and ethanol supporters Tuesday morning offering explanations and promises. On Tuesday of this week, the White House announced postponement of a compromise that had been considered which would have contained potentially damaging changes to the Renewable Fuel Standard. This weekend, KyCorn is participating for a third year in the American Ethanol - Ethanol Fueled with Pride Crappie Masters Kentucky /Tennessee Tournament at Kentucky and Barkley Lakes. KyCorn co-sponsors the event with Commonwealth Agri-Energy to address ethanol use in marine engines with the fishing public.